I see it... Do you? No, I will do a short video of what I am seeing. This is what I see when pictures are posted. I no longer see thumb nail photos. have to change browsers for something that worked before? couldn't see the photos yesterday in stepnstone's thread. I use Firefox and all seems to be back to normal for me. 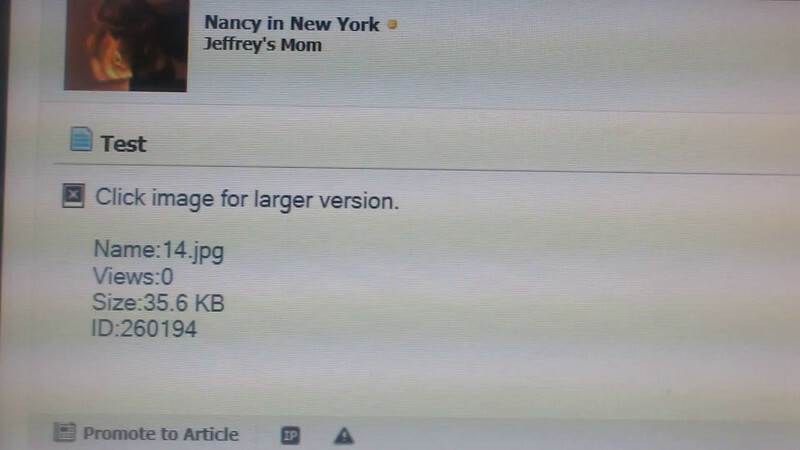 Got the thumbnail of precious Jeffrey and when I click on it I get the enlarged photo, as before. Do you have IE lennysmom? That is exactly what I used to get Maura before the glitch on the 5th of July, when it took out the posts from the 4th. Then it turned everything upside down with no thumbnails and where I can't open photos. This sounds familiar. Nancy, what version of IE are you ising... nevermind, I just opened in IE and am seeing the same thing. I'll chase this. Meantime there's always Chrome/Firefox/Safari... etc. I was recently at Staples (getting a keyboard to replace the one that someone MIGHT have peed into ) and there was a man in front of me who was having similar issues with other websites. The young man who was waiting on him gave a big explanation about IE not being upgraded anymore and therefore being obsolete and causing this sort of issues. Have you tried Firefox? I switched several years ago and really love it. Nancy I am seeing the same as you. I did a restart and I also did a full log off and re-logged in. Still the same. I am using IE, not happy about it but not my computer to mess with. Guess I'm going to mess with it and deal with the issues later. Firefox here I come!!!! And at home I generally use Firefox and I love it. Hope you find a workable solution soon. Yeah, I think this is an IE issue. I just switched to Firefox and everything is great! I'm using Firefox and things are fine. Yup, just installed FF and now I see everything. Jeez, like I have time to sit here and get everything back up and running in FF. And remember all the passwords! Arrrggggg! Ladies, I had SO many problems years ago with IE and TSB that I switched to Firefox at someone's recommendation here. I love it. Probably mine as you and I have had this conversation several times. I love FF, but, the machine I use primarily is the BF's and when he got it he said he did not want FF installed. My machine has FF and I deleted IE totally. The BF's machine was the IE machine and in order to use it I had to set it all up with accounts and passwords....now I have to redo it all in FF on the BF's machine. Ooooo, he's gonna be hot when he sees all my work today. After some digging, it looks like IE 11 has documented issues with the Lightbox functionality (what happens when you click/swipe an attached photo). For some the problem seemed to correct itself running IE in compatibility mode (Tools> Compatibility View Settings) and adding the website in question. No luck when I tried it. Elsewhere, vBulletin has mentioned it, along with alterations in the php code that vBulletin software is built on. I tried one suggestion but there was no change. I may continue to dig for more on this issue. Meantime for everyone's health and happiness here, I highly recommend going with almost anything other than Internet Exploder. EDIT : It worked ! !